It was just over a year ago that your intrepid Toppy Northeast Guy invaded a new market for the site, picking up a whole slew of IDs from Bakersfield, California. Twelve months and change later, I’m finally getting around to putting some of that audio up here, and some pictures up over at Tower Site of the Week. And by now, a fair number of the AM stations you’ll hear this week are history. KHTY 970 went from “W Radio” en espanol to Fox Sports in English. News-talk KERN traded its longtime home on 1410, with good in-city coverage, for the wide-reaching 1180 signal that used to be religious KERI. KWAC 1490 has moved towers. We’ve also got a few bonus IDs, via DX and translators, from the Fresno market to the north, where KGED 1680 has since flipped from the standards format heard here to Spanish oldies. There have been FM flips aplenty in the Central Valley, too, but we’ll get to those next week when we post more IDs and more pictures. Before we got to Spokane, we got to see the drive-through directional array of KWAL 620 in Wallace, Idaho, which straddles I-90. (You can see it, too, at this week’s Tower Site of the Week.) We’ve included that ID under Spokane, just because we couldn’t quite justify creating a one-station Wallace market for it. And we have one holiday bonus for you this week – we were back in a very frequent haunt of ours, Chicago, a few days ago…just in time to have tape rolling as Citadel flipped WZZN back to its heritage calls of WLS-FM. Check out the ID montage that launched the new calls! Inspiration’s in short supply…but IDs aren’t! But we’re still recapping the IDs from Big Trip 2006 for two more weeks. This time around, a big pile of Seattle FMs, and then next week we’ll wrap things up with Mount Vernon, Whidbey Island and that area. 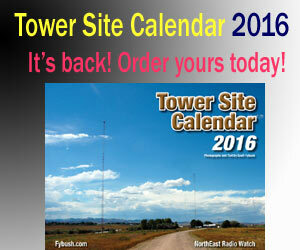 Follow along in photos and text at Tower Site of the Week! That’s only part of the lofty title that the local newspaper gives to our featured community on this week’s Big Trip installment, Wenatchee, Washington. In full, the Wenatchee World claims to be published in “The Apple Capital of the World and the Buckle on the Power Belt of the Great Northwest.” There’s some disagreement on the former, as it appears Winchester, Virginia also considers itself the nation’s apple capital; we know of no other contenders, however, for the latter half of the slogan, which is probably just as well. There are plenty of interesting bits of audio to be heard on this week’s episode, including three-letter-call KPQ and KPQ-FM, plus the over-the-top ID at Spanish-language KWWX, the KOHO-FM ID featuring a translator that isn’t there anymore (they ID “K262AL,” which has moved to 99.9 as K260BE, but they’re still using the old calls), and many more. We’re winding down our Big Trip recap – our final two stops, May 9 and 16, will be Seattle and vicinity. Don’t miss out on the other half of our Big Trip coverage – see the tower pictures over at Tower Site of the Week!